KITWE: 17/01/2016 – His Excellency the President of the Republic of Zambia Mr Edgar Chagwa Lungu graced the United Church of Zambia Golden Jubilee Closing Celebrations. This was held at Kitwe’s Nkana Stadium. The President was welcomed by the Synod Bishop His Grace the Rev Mutale Mulumbwa, the General Secretary Rev Dr Mulambya-Kabonde, Presbytery Bishops and Synod Heads of department. The President was accompany by the first lady her honour Mrs Esther Lungu. 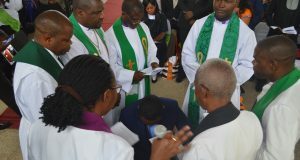 The celebrations were attended by representatives from all the ten (10) presbyteries of the United Church of Zambia. 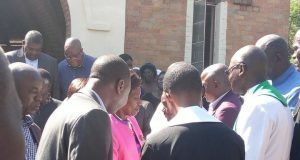 Most UCZ congregations in Kitwe closed their church building doors in order for them to be part of the celebrations. This celebration came after a yearlong celebrations that were launched in 2014 (Lusaka), and replicated in all Presbyteries. The launches were then followed by actual celebrations in congregations, consistories, and presbyteries. The main celebrations were held in Lusaka at the National Heroes Stadium on 18th January 2015. In his speech the President explicitly stated that he personally was proud to identify himself at this worship service with a church that believed in the power of unity and continued to promote that unity through its tagline “all one in Christ”. He acknowledged that most veteran politicians such as Kenneth Kaunda, Simon Kapwepwe, Nkumbula, Dr Mutumba Bull, Lilly Monze and many others that are in the political history books of this great nation were educated and trained in UCZ mission run institutions. He therefore commended the United Church of Zambia for having contributed to the shaping and formation of the Zambian people’s minds, spirits and souls. Having been inspired by the principles and values learnt from those mission schools and training institutions these politicians together with many others started to fight for the independence of this country. The President also noted that barely a few months after Zambia’s independence on 24th October 1964, the Church of Barotseland, the Zambia District of the Methodist Church met with the United Church of Central Africa in Rhodesia at Mindolo in Kitwe to form the United Church of Zambia. As a politician he was also proud to associate himself with a church that had such a rich political heritage. He further encouraged the members of the United Church of Zambia to be proud of its tagline “all one in Christ” because it resonates well with the country’s “One Zambia, One nation”. The President reiterated that fifty years of unity and social action was not something to be taken lightly; it was something worth celebrating for one solid year, hence all Christians had now gathered together to formally close the jubilee celebrations. President Lungu implored the members of the United Church of Zambia on this special day to deeply reflect on what this meant first to each individual member, the church and the nation at large. He personally indicated that he would like to see in the next 50 years the UCZ that continues to groom its members through its rich and faithful teaching of God’s word. By so doing the church will continue to guide this nation through a well-shaped citizenry. He also congratulated the Zambian people and the members of parliament for passing the amended new constitution which he enacted into law at National Heroes Stadium in Lusaka. He also commended the United Church of Zambia for being pioneers in the promotion of gender equality by allowing female ministers to work side by side with their male counterparts in ministry. He further cited the election of Rev Dr Mulambya-Kabonde as General Secretary as a mile stone in this regard. The President also acknowledged the strides the church was making in the provision of higher and quality education. 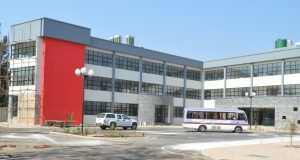 He called upon the corporate world to invest in the newly upgraded University in Kitwe which has other faculties at Chipembi (Agriculture and Veterinary Sciences) and Mbereshi mission hospital (Clinical and Nursing sciences). He then donated a bus that he had won during the raffle draw to the University. He called upon the present Church to hand-over to the next generation the United Church of Zambia which is : 1) more united spiritually, ecclesiastically, and financially- a church growing with a common goal. 2) Well-grounded in good Christian stewardship of all that God has entrusted into its keeping, things like talents, gifts, capabilities, skills, land, money, natural resources, everyday living e.t.c. 3) Solidly grounded on the three principles of moratorium i.e. self- sustaining, self-propagating and self-governing’. 4) Missionary oriented the church that stands to be the physical representation of Christ in its communities. 4) the United Church of Zambia that keeps on growing with spirituality that is relevant in the here and now. 5) the United Church of Zambia that has improved conditions of service with guaranteed social security for all church workers. 6) the United Church of Zambia’s, one and only university built in a more spacious piece of land, provided with modern infrastructure. The President asked the Church to pray for nation as it goes for its general elections. He also encouraged all registered voters to go to the polls in great numbers so that they can together decide the destiny of this great nation Zambia.